lunatic, is just one of the lessons learned at this year's Los Angeles Asian Pacific Film Festival. "I didn't know about the cannibalism before we took on the film," explained Kazuo Hara about the strange stories that emerged while filming his infamous 1987 documentary The Emperor's Naked Army Marches On. He set out to film Japanese eccentric Kenzo Okuzaki's search for the truth about three soldiers he served with in World War II who were executed by their commander--a week after the war ended. Fascinating as that story turns out to be, what made this film a controversial classic was Hara's decision to film the notorious Okuzaki in the first place. Hara had plenty of dirt to dish about Okuzaki, considered by many to be the true villain of the film, including Okuzaki's suggestion that Hara film him murdering the commander who had ordered the executions. Hearing it all from Hara himself was just one of the many highlights of this year's festival. Hara had flown in to help celebrate the festival's 25th anniversary, since Naked Army helped put the festival on the map back in the 1980s. With a robust lineup of docs old and new, there was plenty to see and plenty to ponder. Lesson One: If you can stand the heat, roll film! Hara knew that deciding to film Okuzaki--a convicted felon--might horrify some. Yet, said Hara, "We were fully prepared to suffer the consequences. I don't mind if he's going to go out and commit a crime. It has nothing to do with me." At the time, Hara had just one concern: "If he gets killed, we don't have a film." 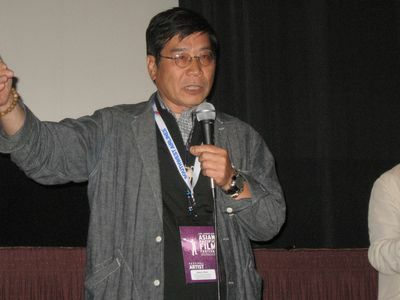 For better or worse, that decision launched Hara's career, resulted in a film widely considered the most important Japanese documentary ever made. The Emperor's Naked Army Marches On is available through Netflix and for purchase through Facets Media in Chicago. A brand new film swept the festival's documentary prizes. Whatever It Takes walked away with both the Grand Jury Prize and the Audience Favorite Award in the documentary categories, quite an accomplishment for first-time director Christopher Wong. 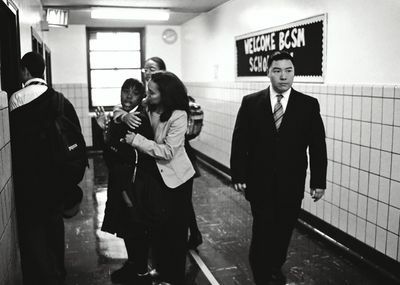 In his Q&A, Wong thanked his wife, mother and grandmother for ganging up on him and insisting he film the story of charismatic Edward Tom, a street-smart New York executive turned high school principal fighting for the futures of at-risk teens in The Bronx. into a Directors Guild of America theater jumping to their feet to cheer when Wong announced that "Mr. Tom" was in the house. Whatever It Takes will air on PBS' Independent Lens in 2010; New Yorkers can see the film at the New York Asian American Film Festival, July 23-26.
the first time in 50 years under the watchful eye of North Korean propaganda officers. Tiger Spirit aired on TV in Canada, but there are no plans yet to air it in the US. In Manilatown Is in the Heart, Curtis Choy offers a marvelous, moody postscript to his acclaimed 1983 documentary Fall of the I-Hotel, with a portrait of legendary Beat poet and Filipino activist Al Robles as he shuffles down the streets of San Francisco, which has re-zoned its Filipino core into oblivion. Manilatown Is in the Heart is available from Choy's website. DVD extras include poetry readings, talk-story and deleted scenes. Lee gives Western Kung Fu romantics a quick kick to the groin by capturing four wannabe masters getting a grueling schooling at Shaolin Temple, China's most famous Kung Fu school. The Real Shaolin is making the festival rounds in search of a distributor, but New Yorkers can catch it at the Stranger than Fiction series on October 6. Other docs in competition for the Grand Jury Prize included Someplace Else, by Kai Duc Luong and Avisheh Mohsenin; Closest Mexico to Japan, by Shinpei Takeda; Patsy Mink: Ahead of the Majority, by Kimberlee Bassford; and Vietnam Overtures, by Stephane Gauger. Lesson Three: Be patient, but if all else fails, go barhopping. The 1987 classic Who Killed Vincent Chin? kicked off a retrospective series by festival host Visual Communications to celebrate the organization's 40th Anniversary in 2010. 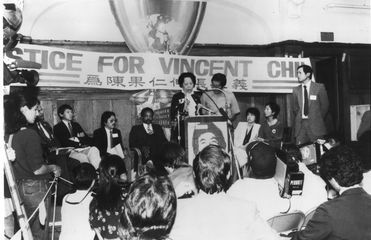 Winner of the IDA Award in 1988 and a Peabody in 1990, the documentary investigates the murky facts behind the murder of Chinese-American Vincent Chin by two Detroit auto workers, resulting in the first Federal case to claim a hate crime against an Asian-American. got defendant Ron Ebens to consent to an interview. She spent three years working on Ebens before he finally agreed to go on camera, greasing the wheels by "drinking with him--you know, barhopping." Ebens' chilling interview is one reason why Who Killed Vincent Chin? still makes a riveting watch 30 years later. The film is unfortunately not available in video stores (because of its expensive music rights), but libraries should carry it. Lesson Four: Pass it on. Tajima-Peña encouraged filmmakers to stay focused on today's changing landscape. "Things have changed a lot," she noted. "Keep on looking at the complications and looking at the changes and keep on revising who we are." An excellent example of her own advice, Tajima-Peña not only executive-produced Whatever It Takes, but also educates new filmmakers as chair of University of California, Santa Cruz's Masters of Arts in Social Documentation. Sounds of the New Hope, a 35-minute short by UCSC student Eric Tandoc, opened for Manilatown Is in the Heart. Stylish and street, this energetic film follows Filipino-American Kiwi, picking up where Al Robles left off by using hip-hop as a tool to organize activism in Philippine ghettos. For news about Visual Communication's screening series of landmark Asian-American films, starting in September 2009, check in at www.vconline.org. For more in-depth reviews of films from the LA Asian Pacific Film Festival, check out Elizabeth Blozan's blog here. Elizabeth Blozan can be reached at betty@betty-vision.com.